Math-U-See is a complete, skill-based, mastery curriculum for grades K-12. Designed to teach students specific skills in a definite, logical sequence, this systematic and cumulative approach will help students learn how to solve math problems and discover why they're solved in such a way. The Math-U-See system features step-by-step procedures for introducing, reviewing, practicing, and mastering concepts with each lesson. Teachers watch the video lesson to learn the new concept and how to demonstrate it; they then present the new concept to the student; finally, students practice the new concept using lesson practice problems from the student workbook. Student-paced, teachers are given clear guidelines for determining when students have achieved mastery and are ready to move to the next lesson or level. 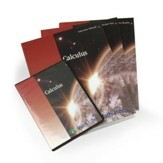 This Calculus Set includes everything you need for the Calculus level, including the Instruction Manual, Instruction DVD, Student Workbook, and Tests Booklet. The Calculus level covers derivatives, integrals, calculus applications, differential equations, and more. The Instruction Manual features 30 lessons with detailed instructions and explanations of concepts. The back of the book contains line-listed answers to the student workbook and tests. The Instructional DVD features Steve Demme teaching a classroom each lesson. Each video lesson will help teachers understand the concepts being taught, as well as how to demonstrate it (as applicable); students can also watch with the teacher if deemed helpful. The Student Text Workbook contains a number of worksheets for each lesson. The Tests Booklet provides opportunities for assessment with a test for each chapter, unit tests that cover multiple chapters, and a final test. Test answers are in the Instruction Manual. Instruction Manual, 474 pages, hardcover. Student Text Workbook, 262 perforated, softcover. Non-reproducible; consumable workbook. Test Booklet, 128 perforated, softcover. Non-reproducible; consumable resource. DVD Requirements: DVDs can be played on DVD player or computer; however, Windows 10 users will need to download a separate video player. Please Note: Unlike other levels in Math-U-See, this level does not have an accompanying digital pack. The Math-U-See Calculus Instruction Pack is perfect for co-op teachers or for parents who just need the teaching material; it does not include the necessary student materials. 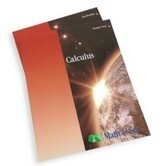 The Math-U-See Calculus Student Text Workbook contains a number of worksheets for each lesson. The Tests Booklet provides opportunities for assessment with a test for each chapter, unit tests that cover multiple chapters, and a final test. This set of the individual workbook and test booklet is great for parents teaching multiple students, or for students taking a co-op class. It does not include any of the necessary parent teaching material (test and student workbook answers are in the Instruction Manual). Student Text Workbook, 261 perforated, softcover. Non-reproducible; consumable workbook.